Hesham El-Rewini, dean of the UND College of Engineering and Mines, expresses thanks to private donors and public leaders who shared the College’s vision to bring a Collaborative Energy Complex to UND. The power of collaboration is bringing new energy to the University of North Dakota College of Engineering & Mines. 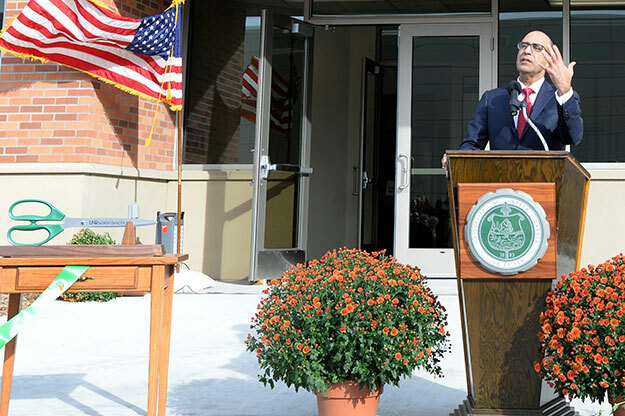 More than 200 attended the dedication of the Collaborative Engineering Complex dedication (CEC), on Friday, Oct. 14. The outdoor ceremony was packed with students, faculty, staff, donors and business and government representatives. All represented groups that worked together to power the project and make it a reality. “Without government, legislators, the North Dakota Industrial Commission, Hess, donors and others, we wouldn’t be here,” said UND President Mark Kennedy. The new front door to the College of Engineering & Mines opens into a bright atrium and collaboration areas, study spaces, active learning classrooms, new labs and a skywalk to the Wilson M. Laird Core and Sample Library. The Complex contains more than 37,000 square feet of research and teaching labs as well as collaboration areas and a first-of-its-kind Engineering Student Success Center. 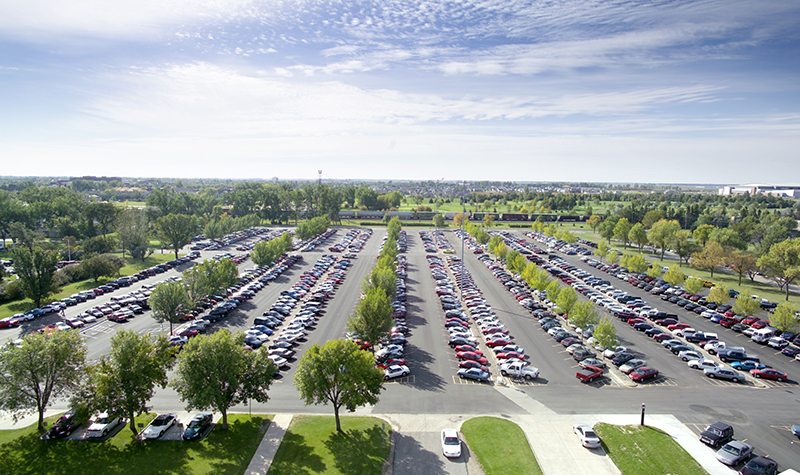 The CEC connects to formerly separate engineering buildings, uniting the College’s civil, geological, electrical, mechanical, chemical and petroleum engineering departments, as well as geology. That was important to lead donor Bob Solberg, an engineering alum who spent his career with Texaco. 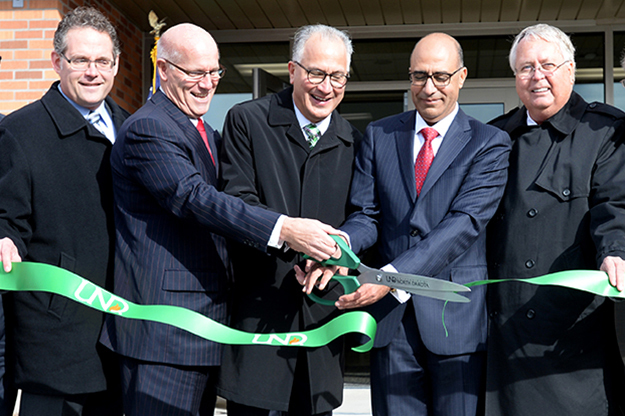 From left to right, Steve Burian, UND alum and co-founder of Advanced Engineering and Environmental Services, Inc.; Steve McNally, a general manager with Hess Corp.; UND President Mark Kennedy, UND College of Engineering and Mines Dean Hesham El-Rewini and Bob Solberg, a UND alum and former executive with Texaco, cut the ribbon on UND’s new Collaborative Energy Complex on Friday, Oct. 14. The CEC also unites donors, industry, business and the state of North Dakota, said Kennedy, and demonstrates the power of One UND, One Grand Forks, N.D. and One USA. 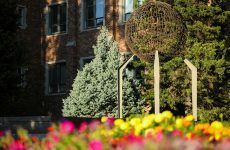 Donors and industry leaders funded the project, and their contributions were matched by the North Dakota Higher Education Challenge Fund. For every $2 given, the Challenge Fund provided another $1. “The Challenge grant program was so successful,” said North Dakota Lt. Gov. Drew Wrigley, whose father is a member of the UND Engineering Hall of Fame. The program and donors, he said, helped Engineering take a huge step forward, keeping North Dakota on the cutting edge of energy development. “We are very grateful to everyone who believed in our vision,” said Hesham El-Rewini, dean of the College of Engineering & Mines. “This is more than a building, and it’s not just for engineers,” said El-Rewini. It’s a core for collaboration, innovation and exploring big things in the area of energy, between students and industry, business and the state, donors and supporters, all of whom invested in our students and the future. 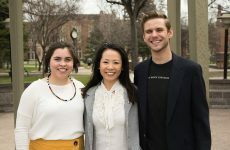 A main occupant of the CEC is UND’s Institute for Energy Studies, which will work with UND’s Energy & Environmental Research Center, School of Law, College of Business & Public Administration, Arts & Sciences and other academic areas to advance energy from an economic, legal and health perspectives. Alumnus Steve Burian, who helped found Advanced Engineering and Environmental Services, Inc., and was one of the first donors to the project, said that UND is critical to the city, state, region and beyond. “UND graduates are smart, hard-working, well-educated,” he said. They want to stay in North Dakota, and he said he’s proud to be part of the College’s progress. Burian and his wife also donated to the project for personal reasons, he said, showing a hint of emotion. UND was generous with scholarships, and he’s glad to help pay back. “The state match was a great incentive,” he added.